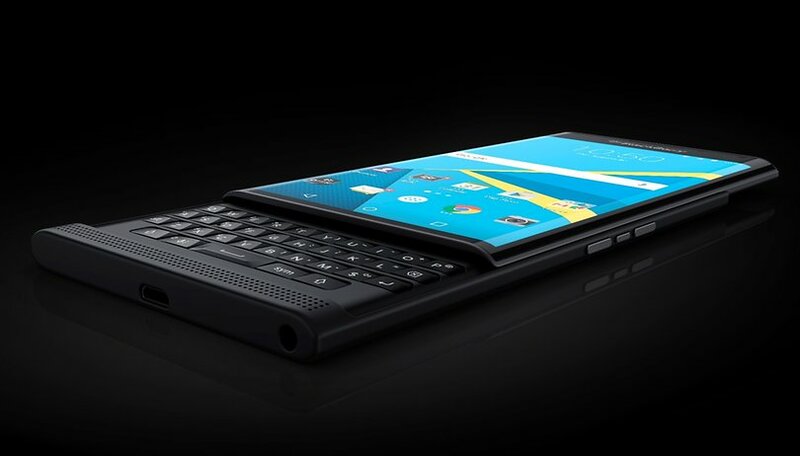 There’s a new contender in Curved Screen Town: the Priv, BlackBerry’s first Android phone. But this town ain’t big enough for two smartphones with dual-edge displays, and the Samsung Galaxy S6 Edge runs the place already. Is the Priv good enough to take Samsung’s place? Let’s find out in our BlackBerry Priv vs Galaxy S6 Edge comparison. BlackBerry built its reputation on smartphones with QWERTY keyboards. The BlackBerry Priv is no exception, and its keyboard is hidden below a slide-out curved screen. It’s an interesting approach, enabling you to have a keyboard when you need it and get shot of it when you don’t, but it does add bulk. The Priv is 9.4 mm thick and weighs 192 g, which is a little chunky when you compare it to the S6 Edge, which is 7 mm thick and weighs 132 g.
Samsung has been rightly criticized for dull smartphone and tablet design over the years, but the S6 Edge is a real looker. The curved screen isn’t a gimmick, the glass and metal combination works brilliantly and it’s both slim and sophisticated. We think it’s Samsung’s best yet. The BlackBerry Priv has a curved 5.43-inch display delivering 2,560 x 1,440 at 540 ppi. It’s an AMOLED with high brightness mode for outdoor viewing, and it’s protected by fourth-generation Gorilla Glass. The curved bits display charging progress and app icons; tapping on them opens little windows that enable you to check notifications or updates without launching the full apps. The Galaxy S6 Edge has a curved screen too, of course; Samsung was the first firm to offer such curvy displays. It’s a Super AMOLED with QHD resolution just like the BlackBerry, but because it’s a little smaller, it has higher pixel density: 576 ppi compared with the BlackBerry’s 540 ppi. We particularly like Samsung’s Edge Lighting, which uses the side screen to let you know who’s getting in touch: if you color-code your contacts it displays the appropriate color when they try to contact you. All things considered it’s a truly exceptional display, and while the BlackBerry appears to match it on paper, we suspect things will be very different when we have the two handsets running next to one another. The BlackBerry has a hexa-core Snapdragon 808 backed with Adreno 418 graphics and teamed up with 3 GB of RAM. Storage is 32 GB, and it supports microSD to take the storage up to 200 GB. The Samsung doesn’t have removable storage, but it does come with a choice of 32 GB, 64 Gb or 128 GB of on-board storage. The processor is an octa-core Exynos 7420 clocked at 2.1 GHz, and it’s backed with 3 GB of RAM. We’d expect it to leave the BlackBerry eating dust in performance benchmarks. The BlackBerry’s main camera is an 18 MP model with optical image stabilization and 4K video recording. That puts it at the very top of the Android market in terms of camera quality. The Edge doesn’t have as many megapixels – its main camera is 16 MP – but it’s still outstanding. The optical image stabilization makes a huge difference in low light, and its nighttime performance is really impressive. It’s the software that makes the Priv interesting: instead of BlackBerry OS it’s running Lollipop. It’s customized slightly and includes some additional apps, including security monitor DTEK, BlackBerry’s own secure communications software and a whole bunch of BlackBerry apps, all of which are now available in the Play Store. Samsung has calmed down on the TouchWiz front these days, so its version of Lollipop isn’t plagued with bloatware and unnecessary 'improvements' like Samungs of old. A Marshmallow update is imminent. We find Samsung’s own UI a little laggy sometimes, but swapping for a third party launcher solves that issue. The BlackBerry’s battery is huge: 3,410 mAh, which BlackBerry says delivers 22.5 hours of mixed use. With a comparatively titchy 2,600 mAh battery the Samsung ought to be getting its coat and heading for the door, but wait: it has a quick charge mode that gives you a full charge in just one hour, and it has wireless charging too. It also has not one but two power saving modes that can double or even triple battery life. Go for the most extreme options and you’ll get two days of battery life, albeit in a grayscale, not much happening kind of way. Let’s assume you aren’t a corporation, in which case BlackBerry’s ultra secure messaging won’t be a selling point. The Priv doesn’t just need to be good to beat the S6 Edge: it needs to be so good that after holding one for a few seconds you become an evangelist and start running up to strangers in the street to tell them how awesome it is. And while we’re well disposed towards BlackBerry and have fond memories of our trusty BlackBerry Pearl, we think that’s a little bit unlikely. The Priv is shaping up to be a pretty good smartphone, but the S6 Edge is already an outstanding one. What do you think? Should we give BlackBerry the benefit of the doubt or is the battle already won? Let us know in the comments below. Quite biased review. I'm a hardened BB user since Siemens went bust, but my wife uses Samsung (after Galaxy 4 and Note 5, now an Edge 6) and I use a BB Z30 and Passport. The Passport so far was my best phone besides the SIM-card slot fault issues. I just got the PRIV and MAN, it's an AWESOME phone. All the advantages of BB OS10 with Android. Secure. Split of business and private use. Battery life - FINALLY a phone which gets me through the day. No probs using a 64GB SD-card for my documents, maps, music and other data. Crystal clear voice and PRIME E-mail support. It's what I need and expect. Only problem for me is that with the non-removable battery, you can't fit in a dual SIM adapter; I sorely miss being able to use dual-SIM in Asia as I need to be reachable on my main number but want to use cheap prepaid local cards. For that I got used to carry a cheap auxiliary phone. I give the PRIV 9 out of 10 points and the Edge 6 maybe 6.5 or 7. If BB would add a second SIM-slot or at least provide some space where dual-SIM adapter could go, I'd give it a max rating. BB's ain't cheap and ain't for everyone, but they're back on track and simply build the better phones. Apple b/s is no option for me. Whoever wants or needs to type a lot will NEVER EVER want to get rid of that full QWERTY keyboard BB's mostly come with; it's my only argument against the Z30 which otherwise is an awesome phone, too. Well at this point, since this excellent article was written, we know that the Priv has had very disappointing sales, not unexpectedly. Now it's not competing with the S6 Edge any more. It's now up against the S7 Edge, and the two areas where BB had a slight advantage, battery life and SD card support have now disappeared. Unfortunately they will not sell enough phones to break even and sadly I predict this is Blackberrys last phone. I'm an old BB user myself, but the only thing this phone had was nostalgia value for the old physical keyboard. Even an older guy like me, who liked those keyboards has moved on to the much faster more efficient on screen swipe typing keypad. As far as phones are concerned, Blackberrys day has come and gone. It's time for them to kick it into touch and concentrate on other business activities. Considering that I have both phones I can't agree with the author's conclusions. Since the software update the Priv's camera now compares to the iPhone 6 S Plus and the O S operates like a charm. Battery life far exceeds the Samsung Galaxy S6 Edge (a real disappointment) and reception is much better. For me with its BB10 features and best keyboards the Priv wins this comparison. Completely biased review. This guy just like Samsung, and that´s all. I'm confused with regards to the hype surrounding DTEK. It's available in the play store so essentially any supported android device can install it. Is the version that comes preloaded on a PRIV a custom version? Well I have just bought the Blackberry Priv a week or so ago, just wanted something different. I was going to go for the Z5 or Z5 Premium, as I have a Z3 & for me it's been an awesome phone. I've owned a few Sony's & they have never let me down in any way. As a family we all have different phones from iphones to Samsung's & HTC, so the Priv has a lot to prove. I still have a soft spot for Sony, & it's hard changing over, however, the Priv is growing on me & in a good way. It's positives far out way it's negatives, I was hoping the Priv would be good, really good & it is. Battery life is fantastic, I would say as good as the Z3, I really like the tweeks Blackberry have done to Android Lollipop, they are very useful, & of course DTEK, that's a no brainer. I use my phones for business & pleasure, business wise the Priv is in a different league to all the others, everything from calendars to Blackberry Hub is so simple to use & set up. Camera is excellent, far better than some give it credit for, & being un-biased towards the Priv. Blackberry I think has created an excellent Android phone, a far better Android experience than all the others, all they want now is for people to get behind them & buy the Priv. Me I highly recommend the Priv, buy it & you won't be disappointed. As an owner of a Blackberry Z10 phone and a Android Galaxy Tab Pro 10.1 tablet (meaning that I use both OS's on a daily basis), I can't help but feel that this article is unfortunatly biased. It is clear that the writer WANTS Samsung to be better. Writer only looks for external factors to cover some flaws of the Samsung, and never does the same for Blackberry. This isn't what your readers are looking for. If one can't write an unbiased opinion, one should stick to write reviews of one's favourite brand, period. it seems like the writer don't know much about Priv. you need to learn more about that super smartphone dude. Well not sure if I miss read or it is left out but BlackBerry Priv do support Quick Charge 2.. And it also supports wireless charging. The only difference between s6 edge and priv should only be the capacity of 2600, 3410 mAh respectively. Dual mode Wireless Charging capable for Powermat (PMA) and Qi"
This caption does priv no justice "The Samsung battery is smaller but the S6 Edge supports fast charging and wireless charging." At least the Priv has an SD slot but is still lacking the removable battery, I assume since it wasn't mentioned in the article. Sliding phones are so 2001ish and I never had much luck with them the ribbon wire that connects the usually breaks or comes loose with heavy use. With touch screen physical keyboard are just not needed any more they are just a gimmick. When Blackberry fist started using them they where a plus, technology has made the obsolete in a phone. Good question! Typing this on a Priv, the phone feels slim enough, but having the extra 30% battery is worth the 2mm. The Priv has battery saving mode too, but haven't needed it yet. The main selling point of the Priv is privacy. Knowing that an app has taken my location over 100 times in the last day is the sort of info I need to decide if I want to keep it. Dtek gives me that, but I'm not sure Samsung has anything similar.